When you step into our Home, you encounter a warm, family atmosphere. Sisters, staff and volunteers work together to create a loving home for more than 100 elderly Residents. 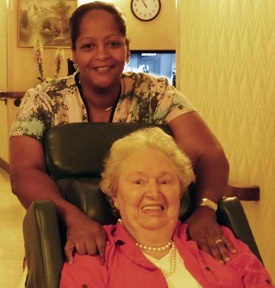 Throughout the entire Home—from nursing, to activities, dietary, housekeeping, and office—our employees share in the Little Sisters’ mission of making the Residents happy. With the Little Sisters serving as role models, employees perform their daily duties in a spirit of "servant-leadership." 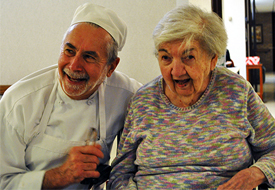 The staff takes their cue from the Little Sisters as they render exceptional "person-centered" care, ensuring that each Resident receives the care and dignity they deserve in the spirit of Saint Jeanne Jugan. Available to full-time employees are health insurance, paid leave, including paid time off for sick time, vacation, and holiday pay, a 403(b) plan, pension plan, and life insurance. If you are interested in learning more about employment opportunities with the Little Sisters of the Poor, please see below. "See how Jesus, Mary and Joseph loved one another, all three, how happy they looked, with what kindness and gentleness they spoke to each other. In our little family it must be the same."